Casey ex Australia: Dawn wall - conquered! On January 15 2015 Tommy Caldwell (36) and Kevin Jorgeson (30) managed to complete their groundbreaking Dawn Wall project. Begun by Caldwell in 2007 with Jorgeson joining in 2009, both climbers routinely spent weeks to months each year encamped in tiny hammock-tents thousands of feet off the ground as they worked on mastering the project. Like every other slab of stone in Yosemite Valley, El Capitan has been climbed by more than 100 distinct routes, most involving the use of 'aid', mechanical systems to help the climber. Purists within the sport prefer to climb 'free', that is, with hands and feet and ropes only to catch a climber if they fall. At which point they generally begin again from the bottom of that section. Like every other big wall climb, the Dawn Wall is broken up into multiple sections (32 in this case) or 'pitches' approximately as long as the 200' rope the climbers use to belay each other. What sets the Dawn Wall apart is the extreme technical difficulty of the climb. The central six (out of 32) pitches are the hardest - each individually as tough as the hardest walls you would find in any gym, and all thousands of feet from the ground. Over New Year Jorgeson struggled for a week with pitch 15, tearing skin from his finger tips during a traverse rated 5.14d in difficulty, so hard perhaps only a few dozen climbers in the world could ever repeat it. 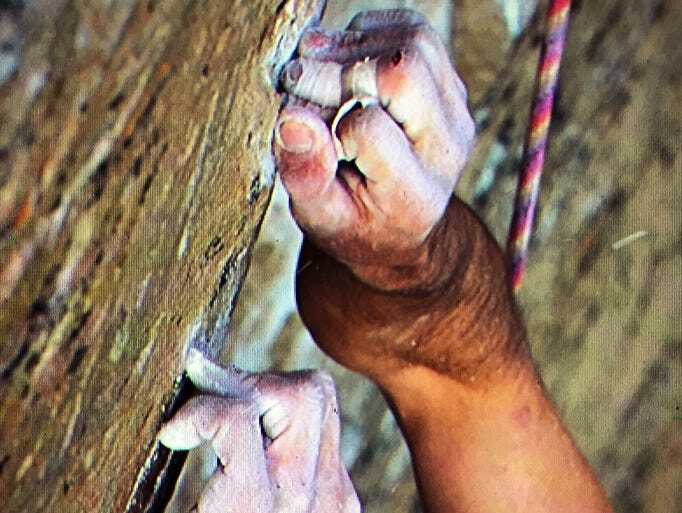 When a crucial hand hold snapped in 2012, pitch 16 went from difficult to impossible. Their nearly 3000 foot route up the slab stymied in the middle by eight feet of blank rock with nothing to stand on. Caldwell and Jorgeson realized the only solution would be to jump, the handholds on either side no bigger than a door frame and made of razor sharp granite. While one of (if not) the hardest climbs ever completed, the Dawn Wall is more of a beginning than an end. Previous generations of climbers celebrated the free climbing of El Cap by the least challenging (and then only possible) routes. Today, top climbers often spend years developing routes that are deliberately challenging in keeping with an emerging aesthetic that favors bold, audacious lines. On the completion of this nearly decade long project, Jorgeson said "this is not an effort to "conquer". It's about realizing a dream. I hope it inspires people to climb their own Dawn Wall." Looking forward to a shower and walking on flat ground after 19 days, Caldwell remarked "I would love for this to open people's eyes to what an amazing sport this is. I think the larger audience's conception is that we're thrill-seekers out there for an adrenaline rush. We really aren't at all. It's about spending our lives in these beautiful places and forming these incredible bonds."